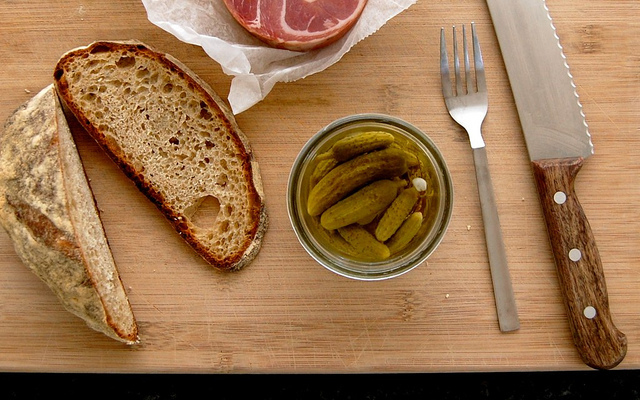 Every Sunday night, I feature a few photos from the Food in Jars Flickr group here on the blog. These are just a few pretties from the last week. If you’d like to see your photo featured in this site, please head over to Flickr, join the group and start adding your images. Homemade cornichons from Eunny Jang. Love ’em! 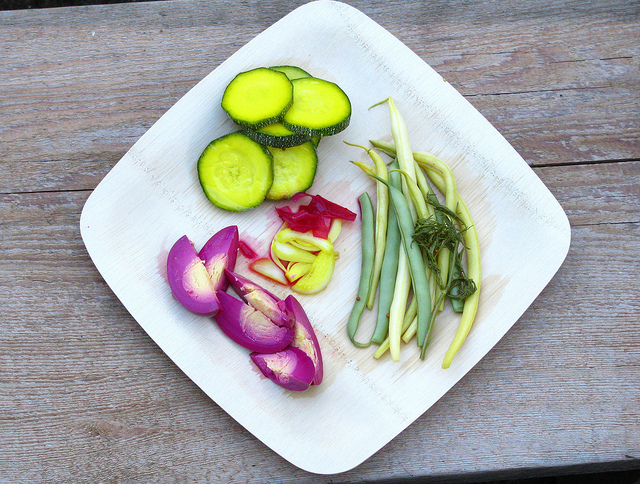 A plate full of homemade pickles from The Root Cellar’s Garden. Yum! 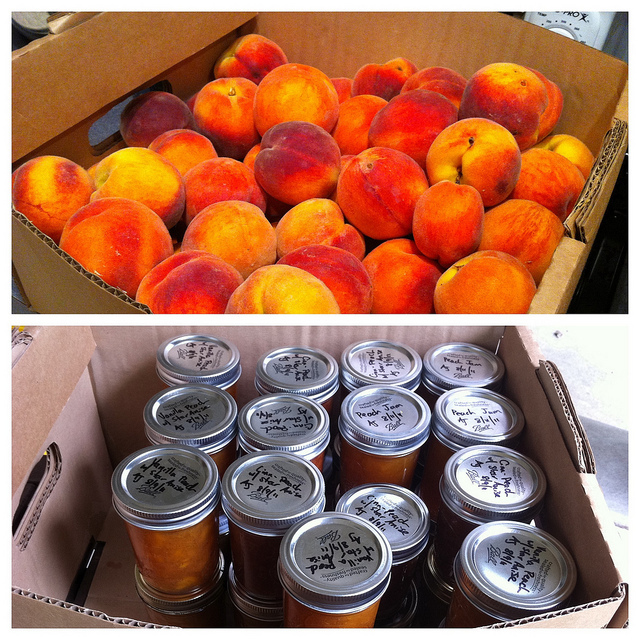 The transformation of peaches into preserves from sakuraboy. 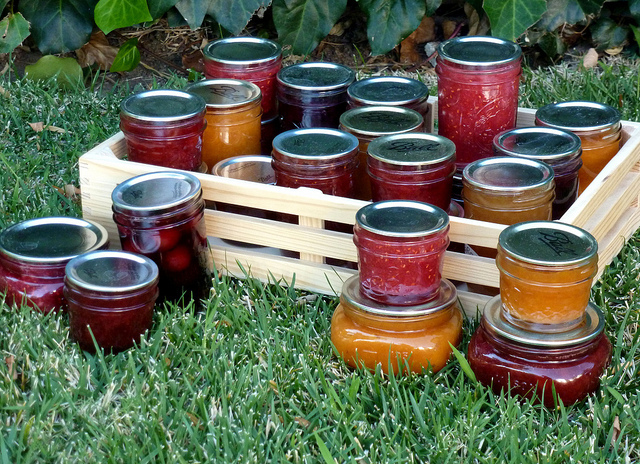 So many jams! From Chicken Julie. 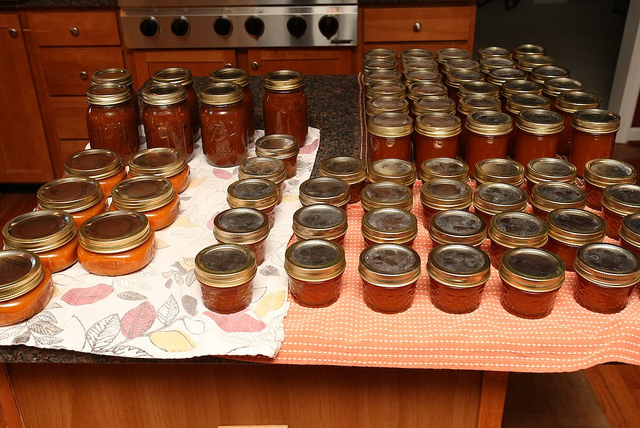 Twenty-five pounds of apricots, transformed into 33 pints of butter, chutney and jams. From Mama Urchin. Makes sense, since she was the inspiration for my apricot rosemary jam. A variety of herb-infused vinegars from Sidewalk Shoes. 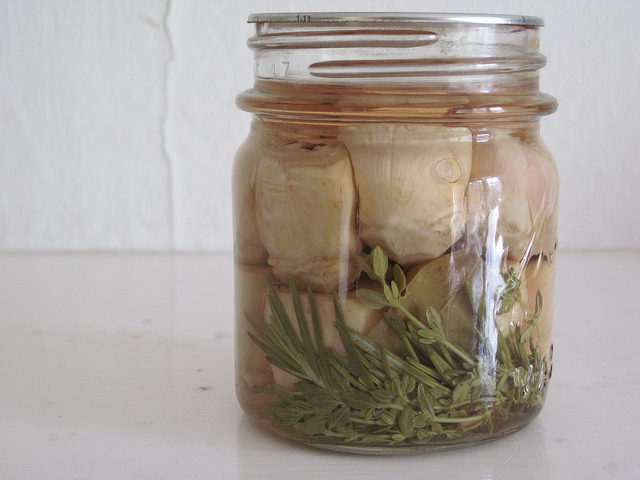 Pickled artichoke hearts from Cory*. 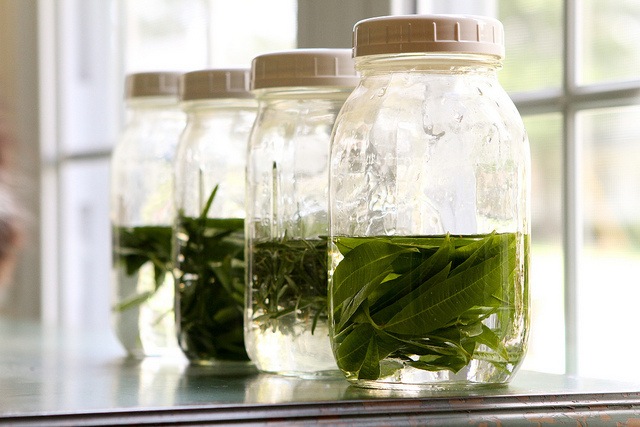 This picture makes me think that I need to make some pickles with fresh rosemary. 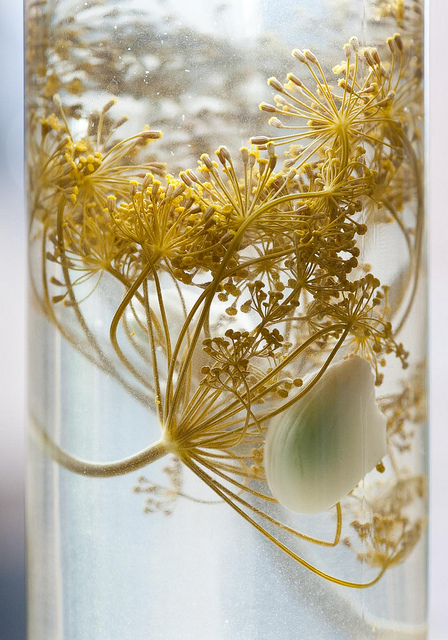 Dill-infused vinegar from M Bartyzel. Who knew how beautiful vinegar could be? 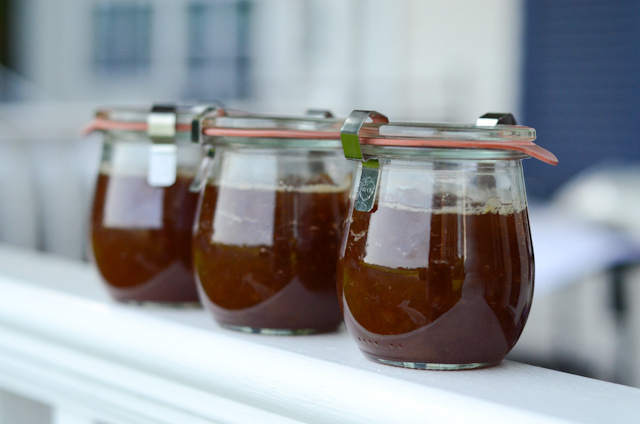 Rhubarb jam in pretty little Weck jars from homesprout. Mmm. Those big fat jars are so cool looking! What size are they?! $15 of apricots to fill 73 jars, not too bad if you ask me! I love the photograph of the dill infused vinegar. It really is beautiful! Love those Weck Jars! Great line-up. Gramma always warned me to “never store my canned food stacked jar on top of another jar”. Her warning was that the weight will break the seal of the jar below. In all the pantries and photos I see folks stacking jars for storage…I’ve never dared (because of gramma’s warning). When I took the WI Master Food Preserver class we got that same warning…but if so many do it with no ill results…I may try it…it would make so much more room for jars in my cabinet. The only reason I’ve heard as to why you shouldn’t stack jars is that if the seal goes bad, you won’t be able to tell. I haven’t heard anything about the weight of the upper jar breaking the seal.